So, I'm getting rather fed up with the AA taking the michael every year with their renewals. Yes, I gather the RAC are just as bad but I think they need to realise their customers aren't stupid, know exactly what they are playing at, and can do the maths. I want to highlight what I think is a particularly dirty trick, making something look like a free perk when it's anything but. This is for a single car policy covering Roadside, Home Start and Relay starting July 2012 paying annually for a year up front. (The monthly option is 10% more expensive, go figure). Numbers rounded to pounds. That means, the AA are pricing their gold benefits at £27 even though they look like they are free on the renewal letter! Some cheek. European Breakdown Cover - only useful if you are going abroad (obviously), did you really want to be paying for it? Key Insurance - this could be valuable, but £27/year sounds like very expensive insurance to me even though they are expensive items to replace. Legal Advice - Included as standard! So not a gold benefit at all. Weasels. Technical Advice - Included as standard! See above. Still weasels. So it turns out that the supposed discount of £44.90 on the posted renewal was actually a £46 insult to my intelligence. I'm no money saving expert, but that's outrageous. just had my renewal £235. I checked the RAC online for the same cover £105. I phoned the AA and was told the computer had made an error. It hadn't taken off my 21 years loyalty discount and free home start. They got it down to £120 i said i was going to the RAC and they matched the price. I have just had my renewal today with congratulations you are now a Gold member! 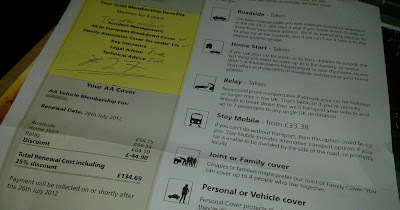 For Roadside, Relay and Joint cover membership this has now jumped upto £16o.85. Every time I ring the A.A. to query it, I get a recorded message saying due to the high number of calls they cannot speak to me and the line goes dead. Timeto go to RAC Green Flag? Renewal notice £180 after 44 years with the AA. Same cover with RAC, £111. Phoned AA, and after a bit of bluster and spin from the fellow he then reduced to £110. I nearly didn't acept. I dont like being treated like this. Next year I'm going to move to the RAC. Having been through a similar experience myself on the last 2 renewals ("discounted" renewal costing more than a web or phone one), I was concerned about your comment about the Gold membership not being free after all (especially as it was set up by the AA without my consent). So I phoned the AA again to ask them about it, and was told that the Gold membership is definitely NO ADDITIONAL COST. Similarly, they told me that the legal and technical advice lines are NOT available to non-Gold or non-Silver members. Actually, my original worry was that if I activated the key insurance, it would be free for that year, but then chareable in subsequent years (especially as they insist that you confirm that you've been advised to read the T&Cs, but they only send the full T&Cs after you activate - dodgy!). Anyway, I was assured that this would not be the case: the service would remain free in subsequent years. So, I'm still not terribly pleased with the way AA conduct their business, but some of the claims in your blog article appear to be incorrect. Just renewed AA cover. The quote was £142.08, phoned and spoke to advisor after seeing online new members quote for the same cover would be £104.99. Said I felt penalised for being with them for 13yrs, and was thinking of going to RAC. They matched the online price, so paid £104.99. It certainly pays to query it but I still feel a bit annoyed at being taken for a mug.